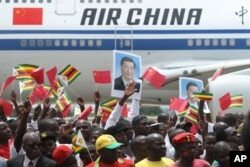 Will Chinese President's Visit to Harare Stabilize Ailing Zimbabwe Economy? 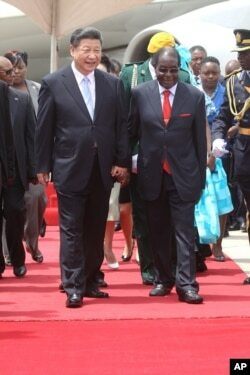 President Robert Mugabe and President Xi Jinping at Harare International Airport on Tuesday. Chinese President Xi Jinping’s visit to Zimbabwe has raised hopes among many in the country that China could help stabilize the country's faltering economy. Zimbabwe has over the past decade placed so much importance on China in its Look East policy as the West shut its doors on Harare through sanctions. There are mixed reactions over Mr. Xi’s visit with many wanting to see the so-called mega deals signed by Harare and China beginning to change their lives for the better. China is Zimbabwe's biggest foreign investor, pumping in $600 million dollars into the country in 2013, according to the Chinese Ambassador to Harare, Huang Ping. With Zimbabwe struggling with mass company closures and lay-offs, high unemployment, food shortages, low liquidity and foreign direct investment, many people are hoping that Mr. Xi’s visit will not just be a symbolic tour but help change their lives. Chinese President Xi Jinping, right, and Zimbabwean President Robert Mugabe hold hands upon his arrival in Harare, Zimbabwe, Tuesday, Dec. 1. 2015. The fact that Mr. Xi brought with him a "strong" business delegation, some say it is a sign that China is serious about helping revive Zimbabwe’s economy. But President David Norupiri of the Zimbabwe National Chamber of Commerce says Harare and Beijing are in a balanced economic relationship, adding Zimbabwe’s economy will not remain the same after Mr. Xi’s visit. "It shows that the Chinese government is seeing a brighter future for Zimbabwe and they are showing confidence in the economy. We have to cooperate and make the doing of business easier so that we don't block this investment. Normally if the Chinese president comes with his team they mean business. This is a win relationship,” says Norupiri. Former Ambassador to China and war veterans’ leader, Christopher Mutsvangwa, is ecstatic about Mr. Xi’s visit. Mutsvangwa says China has brought a lot of investment to Zimbabwe, adding the visit is not just a symbolic visit. An unidentfied Chinese national and a Zimbabwean man hug while welcoming Chinese President Xi Jinping upon his arrival in Harare, Zimbabwe, Tuesday, Dec. 1. 2015. Secretary general of the Zimbabwe Congress of Trade Unions, Japhet Moyo, is however, dismissing the visit by Xi Jinping. He contends Zimbabwe has not benefitted from the trade relationship between the two countries. Prosper Chitambara, an economist with Labour and Economic Research Institute of Zimbabwe, says China is benefitting more from the relationship with Zimbabwe than Harare. Zimbabweans wave flags while welcoming Chinese President Xi Jinping in Harare, Zimbabwe, Tuesday, Dec. 1, 2015. 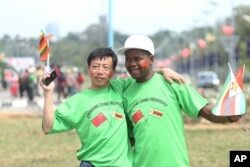 With the hype that has been created by the Chinese president’s visit, Zimbabweans eagerly await to see the much-touted mega deals coming to fruition and changing their lives for the better.